Leonardo DiCaprio and Tom Hardy star in this award-winning epic adventure based on real events. 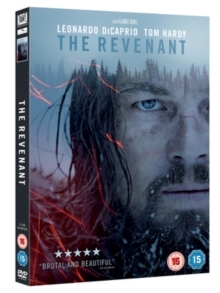 While on an expedition in the American wilderness, explorer Hugh Glass (DiCaprio) falls victim to a near-fatal bear attack and is left for dead by the rest of his team, including his friend and confidant John Fitzgerald (Hardy). As the barely alive Glass struggles to find help and shelter in the inhospitable winter, the love and longing for his home and family, along with the thought of getting revenge on the men who left him to die, is all that gives him the strength to continue. The cast also includes Domhnall Gleeson, Will Poulter and Paul Anderson. The film won Golden Globe Awards for Best Motion Picture - Drama, Best Director and Best Actor - Drama (DiCaprio) as well as five BAFTAs including Best Film, Best Leading Actor (DiCaprio) and the David Lean Award for Direction and was nominated for twelve Academy Awards including Best Picture and Best Supporting Actor (Hardy), winning Best Actor (DiCaprio), Best Director and Best Cinematography.